Last week Charting Chad predicted the price would remain trapped in the 6000s and would end the week about even. Meanwhile, the Tarot’s predictions were… less accurate. What are Conroy’s excuses? Will Chad be a good winner? What are the predictions for next week? 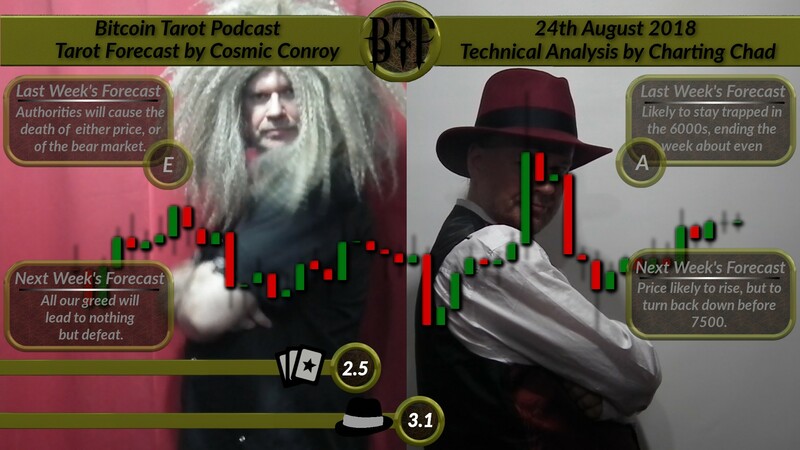 In this week’s Bitcoin Tarot Podcast we answer all these questions and of course the main one: Can the tarot beat technical analysis? [Tarot-Synopsis] Greed and confusion will lead to defeat. [TA-Synopsis] Price likely to rise, but to turn back down before 7500.